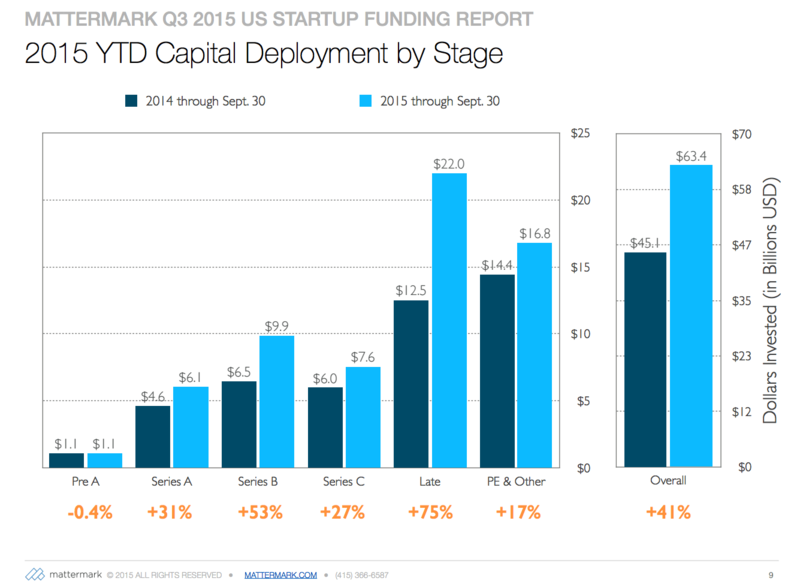 Each quarter, the analyst team at Mattermark puts together a summary of the past 3 months of deal activity in the US startup ecosystem to help investors get a sense of the overall market trends. This report takes a step back to examine the bigger picture alongside recent activity, to help you calibrate your gut feel for the markets with objective data. Download the 33-page free report here. The key trend which continues to emerge is the concentration of capital in fewer rounds, as evidenced by a decrease in overall deal count and an increase in total funding dollars deployed. Earlier this year the trend was more of a barbell between early and late stage earlier this year has continued to develop throughout the year, and now it is the late stage that is seeing a clear surge while deal volume and capital for this year has stabilized at the same levels as last year. Did you know you can use Mattermark Professional to access all the underlying data from this analysis? Sign up for a free trial today.